This is another archival repost, originally written for the old blog in May 2008. 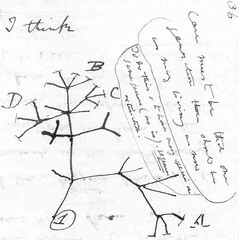 Darwin’s 1837 phylogeny, with root and branches. I’ve talked about Horizontal Gene Transfer (HGT) o n the blog a few times before, particularly in the context of bacteria acquiring genes for things like antibiotic resistance, and in the context of operons (more of which in a week or two). Jeferson Gross, Jörg Meurer, and Debashish Bhattacharya have an interesting story to tell about HGT in last week’s BMC Evolutionary Biology. Firstly, the brief introduction to HGT for those unfamiliar. Genes like to make copies of themselves — or rather, natural selection tends to favour those genes which are good at making copies of themselves. There are two principal categories of methods by which genes ensure their presence in increasing numbers of individuals. The obvious one is vertical transfer: when cells divide, the daughter cells each contain the same compliment of genes; and offspring inherit their genes “vertically” from their parents. The other category, horizontal transfer, makes things so much more complicated and fun. In horizontal transfer, a few genes (usually a fraction of the total possessed by the individual) are copied and given to another individual. That individual does not have to be closely related — indeed, in extreme examples they can be as distantly related as a bacterium and an animal. HGT is common between bacteria, but rare in eukaryotes (animals, plants, etc). HGT has some very interesting consequences for the process of evolution, and for the way we see the history of life on earth. The image of the “tree of life” begins to break down, especially in bacteria — there is no longer a branching lineage which can be traced back to the universal common ancestor. Rather, there is a network of crisscrossing lineages, diverging and merging. Pairs of genes depart, while other pairs meet. The genomes of modern bacteria are chimeras made from bits and pieces of very different ancestors. This makes things difficult for those researchers trying to describe what life was like a few thousand million years ago, when the earth was young. It is generally believed that ancient life experienced a great deal of HGT, and genes were flowing all over the place. This view may to some extent have arisen as a result of the common image of ancient life as being just-like modern bacteria — simple, unsophisticated and dull. Trouble is, modern bacteria are not simple or dull, and they have particularly sophisticated devices to enable HGT. The process of “bacterial conjugation” involves the construction of molecular needles, the transmission and recognition of “mating signals”, and the activity of a specialised enzyme complex. This is a complicated system which must have arisen at some point through evolution. There is therefore no reason to automatically believe that HGT has been rampant forever, and whether HGT was common in ancient organisms is an empirical question. How do you go about answering a question like this? It can not be answered by any fossil, and the nature of HGT makes it very difficult to get an answer of any use by sequencing genomes and drawing trees. Fortunately, there is a window — or rather, several windows — on ancient life. There is a group of microorganisms which have become totally isolated such that they have been unable to participate in HGT. Though they have still been subject to other evolutionary process, these organisms provide a good estimate of their free-living ancestors of 1,500 million years ago (mya) — they are living fossils, if you like. The organisms — if they can still be called that — are plastids. The plastid that you’re most likely to be familiar with is the chloroplast — responsible for photosynthesis in plants. Chloroplasts are the descendants of once free-living cyanobacteria. Around 1,500mya a cyanobacterium found itself stuck inside another, larger cell. The cyanobacterium found its new shelter comfortable, while the host cell found the cyanobacterium’s photosynthetic nutrients useful; the rest is history. So things are as simple as looking at the genes in the chloroplast genome and determining where they came from? Well, actually, evolution never makes things that simple. Over the millions of years that the chloroplast has been sponging off plants, bits of the chloroplast genome have migrated into the plants’ nuclear genomes. Chance events got those fragments from the chloroplast to nucleus, I imagine. Selection perhaps favoured their new home — for safety from mutagens, access to more sophisticated control of gene expression, or more advanced DNA repair mechanisms, perhaps. Whatever the reason, we now find bits of the plant genome that look uncannily like bits of the cyanobacterial genome. So, now we get to Gross et al‘s contribution to this story. In their paper they look at the men family of genes. This family contains eight individual genes (A–H), the products of which are enzymes involved in a photosynthetic pathway. These genes are very similar to other metabolic genes found in bacteria, where they are clustered in operons. Gross et al found that in plants, seven of these genes are found in the nuclear genome, but we can be reasonably sure that they originate from bacteria (via chloroplasts) because they are also arranged in an operon-like structure in the plant genome (plants do not usually have operons). Additionally, a relic of the operon containing these seven genes can still be found in the chloroplast genome, albeit mutated and unused. Now, if you believe John Maynard Smith, the fact that these genes are arranged as an operon is itself evidence for HGT, as JMS’ hypothesis is that operons evolved to aid HGT. Of course, not everybody does believe JMS, and alternative hypotheses about the selective advantage of operons have been proposed — for example, that operons are the simplest way to control and coordinate the expression of a team of genes. But Gross et al have additional pieces of evidence. Firstly, one of the eight genes, menA is not found in the cluster of genes, suggesting that in the ancient ancestor of plastids this gene had a separate origin to the seven genes in the operon. And secondly, having created phylogenetic trees of the men genes from plants, algae, and a variety of bacterial species, they find that several (but not all) of the nuclear encoded men genes from plants look uncannily like those from green sulphur bacteria — even though they almost certainly found their way into the nuclear genome via the chloroplast. There are lots more details and suggestions for the histories of these genes, but I needn’t bore you with them. The important point is that the simplest explanation for this fossilised mosaic genome is that HGT was well established 1,500 mya, and we are therefore justified in making the assumption that HGT has been around for a significant fraction of life’s history. Perhaps, even, early life really was just one big gene pool — a river out of Eden, with genes mixing in the eddies and rapids.